This Friday, the widely anticipated and long-awaited state of the Earth and its climate will be released by the UN’s climate assessment body, the IPCC. In a pre-emptive strike, the right wing media last week launched a full front attack to discredit the climate science using leaked drafts. In the past week, we've seen a host of vitriolic ‘they got it all wrong’ stories ranging from the Mail on Sunday to Rupert Murdoch's The Australian and the Wall Street Journal. For most of us, being non-climate scientists, it is confusing to make sense of the facts and counter- arguments. If one takes out opinion and ideology and leaves it to the scientists, which seems a good strategy to me– the next stage for climate skeptics is to discredit them. I don’t understand this. I don’t comment on medical advances as I am not a doctor, but it appears that everyone is an expert on climate change. If 97 doctors cite one diagnosis and three others have a different opinion, it’s likely I will believe the majority. If weather forecasters tell me there is a 90 percent chance of rain in the morning, I will probably take an umbrella with me. These climate skeptic journalists, working from leaked incomplete versions of the report, apparently know more than the 830 expert authors from 85 countries who have in large part, dedicated their lives to this work. 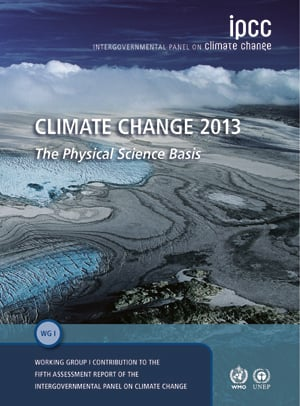 Working Group 1, which is the first part of the report due out next week, summarizes the Physical Science IE. What’s happening to the ocean, atmosphere, ice-caps and beyond. It uses findings gained from new technology which like all things in our increasingly IT-led world, have moved with incredible speed. Satellites in the sky, buoys floating in the ocean and ice cores that provide a carbon record from far back in Earth’s history are all part of the sophisticated armory used. Alongside this progress, computing advances now allow for increasingly realistic and reliable models of the climate. So, scientists are able to examine the complex physical, chemical and biological processes that influence the Earth’s climate in finer detail than ever before. In addition they can project how it will change as a result of human activities. If climate skeptics really want to properly engage in the debate, surely the time is when the results are released and final. To me it seems a cheap shot to go in ahead of time and present skewed, selective findings when the scientists in questions can’t respond publicly until the embargo lifts. 3. Twelve prominent climate scientists and experts from across the globe state that "the body of evidence is overwhelming" and that dangerous climate change is happening. The full statement can be found here. 4. And in Germany, this strong editorial made the front page saying, “The empirical evidence for accelerated climate change is strong. Yet many still call it into question or dismiss it as scientific mumbo-jumbo that should be filed away and forgotten. These individuals obscure one thing in particular: their own interests." In a few days, governments and scientists from around the globe will agree and sign off the executive summary of this new report. Perhaps we should all just sit tight and wait to see what it says; then think about what needs to be done to keep the global average temperature rise at less than 2°C above pre-industrial levels. Surely that, and not the current war of words, is the important part.